Artist Sponsorship Pitch (Triple or Quad booth only) - Please get in touch for further details. Trade Sponsorship Booth - Please get in touch for further details. Please save files with name of artist (if booking more than a single booth). Once payment has been sent, please email info@cirquedutattoo.com to inform us of your payment. We will then send a confirmation email with further details. Every artist working Cirque du tattoo must send the organizer a copy of their registration certificate/license. Artists/traders must have their booths set up by 10:00am on Saturday and have completely cleared their booth by 9:00pm on the Sunday. Any equipment/personal belongings left behind at the venue not claimed by 11:00pm on the Sunday will be will be disposed of as the organizer deem fit with no compensation. Artists must adhere to the registration/set up times as set out in information pack. Cirque du tattoo attempts to attract members of the public to the event at the best of our ability but we accept no responsibility for final numbers at the event. All artists/traders are required to have adequate public and product liability insurance. All artists must send over their portfolios when a deposit has been paid so we can use it to advertise them for the show, if portfolios are not sent over we don’t take any responsibility for not advertising you. All tattooing/trading must cease by 8:00pm on Saturday and 7:00pm Sunday. All artists must conform to current Environment Health by laws relative to their local administrative area. All electrical equipment must be P.A.T. tested and in date. We will have a qualified electrician available on site if needed. Any equipment found not with a valid stamp will not be allowed to be used. Tattoo supply trade stands will sell to registered artists only. Only artists registered to work the event can tattoo at the event and artists not adhering to this may be asked to leave the event. Artists should use disposable and single use equipment wherever possible i.e. needles, pigments, gloves, tissues, spatulas, pigment cups, ointment, aprons, machine bags, lead covers, tubes and grips etc. Only the artists, clients being tattooed and the registered helper should be in the tattooing space when tattooing is being done. Hand washing facilities are provided, please ensure good hand hygiene. Keep the tattooing area clean and disinfected prior to/after tattooing. Clinical waste must be disposed of in waste bags provided, except for sharps, these must be disposed of into the sharps boxes provided. Samples of Yayo Water Solidifier will be provided. No alcohol is to be consumed in the tattooing booths. only artist and the allocated helpers with have wristbands anyone else you bring i.e. customers must pay for a ticket. 32. No pins/tape/nails etc. to be used on any interior surface/wall in the venue. Entry to the after party on the Saturday is only valid with the correct wristband. Security and their decision on security issues is final. The venue will open on Friday evening between 6:00pm & 9:00pm for any artist/traders to unload equipment/stock. Doors will be locked at 9:00pm (no registration will take place at this time). The organizers reserve the right to refuse any artist to continue working if any of the rules are not adhered to. By ticking the box and signing at the bottom of the page you are agreeing to have read and understood all the Terms and Conditions of the event. Only when you have written confirmation off us are you confirmed as attending/ working the event. As exhibitors we agree to pay the total cost shown above. 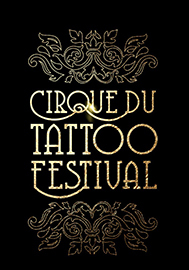 We hereby declare that we have read and accepted the terms and conditions of the participation contract and agree to abide by the Rules and Regulations of the Cirque du tattoo festival 2017 (as set out in the Exhibitor Manual) and any agreements which may be imposed by the relevant authorities or the venue as a condition of allotment of space. We hereby sign and agree to be bound by them. Any booking is only valid after it is confirmed by the organizer and if the payments are made in full and on time.